Learn to change the self-critical stories in your mind and rewire your brain so that you gain the self-confidence to build more fulfilling relationships, careers, and social life. Since childhood, our experiences and interactions have shaped the running narrative of who we are and how we view ourselves. When those interactions are painful, many of us have a tendency to internalize the negativity, translating mean or selfish messages given to us by family, friends, or teachers during our youth into truths about who we are—our flaws, failures, and shortcomings. 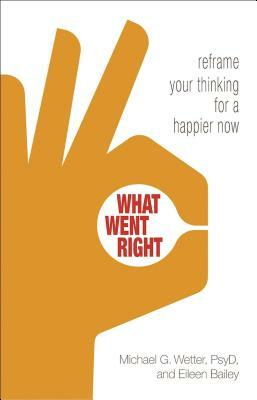 Through practical and easy-to-understand principles and techniques, What Went Right teaches you to recognize and intervene on self-defeating thought processes and uncover your core beliefs about who you really are. Through these exercises, you will learn how your thoughts drive feelings that influence your behaviors. By changing your thinking, you can unlock self-affirming feelings and actions needed to create your new life story and become the person you want to be. Michael G. Wetter, PsyD, is a licensed clinical psychologist specializing in adolescent and adult populations. He has served as the Chief of Adult Psychiatry Services at Kaiser Permanente Medical Center, Hayward, Calif., and is a member of the clinical staff at Cedars-Sinai Medical Center in Los Angeles. Dr. Wetter has been an expert consultant on television programs and newspapers including the Washington Post, the Boston Globe, and the Atlanta-Journal Constitution, and for such magazines as Men’s Health, Forbes, Prevention, and Redbook. In addition to having a private practice, Dr. Wetter trains professionals, lectures, and publishes extensively in professional journals on dialectical behavior therapy. He has extensive experience in issues pertaining to emotional dysfunction, diagnostic consultation, and program management. You can find him online at www.drwetter.com. Eileen Bailey is a freelance writer specializing in mental and emotional health issues. She writes for several national health and wellness websites, and is the lead writer on topics like ADHD and anxiety, as well as on sexual health, skin care, and skin cancer. Ms. Bailey is also a contributing writer for ADDitude magazine online. She is the co-author of The Complete Idiot’s Guide to Adult ADHD, Idiot’s Guide to Cognitive Behavioral Therapy, and The Essential Guide to Asperger’s Syndrome.